My day job is executive director for Wisconsin Urban Wood, a statewide network of independent businesses and nonprofit organizations recycling urban trees back into the social and economic lives of communities across Wisconsin. 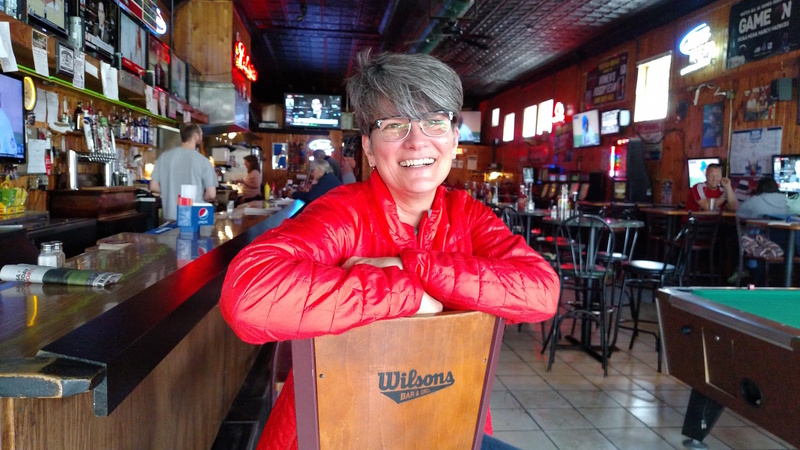 I’m also the executive director and co-founder of Sustainable Atwood, which is an organization in the SASY (Schenk-Atwood-Starkweather-Yahara) neighborhood on Madison’s near-east side that creates models of sustainability for neighborhoods. Our star programs are the Atwood Tool Library, the Sustainable Atwood Metro Commute Card. My most memorable caffeine experience is learning I can’t have too many chocolate chip cookies in the afternoon if I want to get any sleep! My current caffeine of choice is Revolution Roast from the Just Coffee Cooperative. It’s fair trade coffee from a local company that treats its growers and its staff exceptionally well and it tastes fantastic—Revolution Roast also goes by the name of the best bike shop in town. My favorite place for caffeine is in my kitchen at 5:30 in the morning. It’s me, the Bialetti pot, two scoops of espresso [Revolution] roast and the gas stove. The sun is just coming up and my cat is looking longingly at its food bowl, while we all wait for the steam in the pot to announce, “Sssset, go!” It’s one of my favorite things. The people I’d love to share a cup of caffeine with are all the women in my family. The young and old, every one of them—they are strong, smart, witty women who inspire me. I’d love to have them surrounding me in one place. When I’m with them, they make me feel like I can do the impossible. They are my roots—just what I need. If I were going to have coffee with someone famous, I’d pick my childhood idol: Gandhi. We’d sit on the ground, smiling at one another, happy to chat about the rewards of making what we need from what we’ve been given. World problem that could be solved with the right amount of caffeine: Family harmony, and, by extension, community harmony. There’s a line from Chinese philosopher Lau Tzu in his Tao Te Ching, that cautions us not to become bored at the banquet table—that is, to remain aware of the beauty that surrounds us—in people and in places. The right amount of caffeine could change our perception and help us recognize the beauty in others—extensions of ourselves—that we are all connected and deserving of compassion and understanding. It might take a big cup of caffeine to gain this appreciation, but it wouldn’t be the first cup of miraculous liquid ever poured.